When it comes to great jazz. Upon just hearing a few notes of his astronomically famous piece “Take Five,” one would never guess that the man designated a “Living Legend” by the Library of Congress, Mr. Dave Brubeck had never mastered the art of reading sheet music. Called one of the undisputed “vanguard[s] of the so-called West Coast school of cool jazz in the 50’s,” by Acrobat Music on their release of this fascinating vintage collection of rare live broadcasts, he eventually became the first jazz artist to “sell over a million copies” with his 1959 recording Time Out. While it’s incredible to believe that one of America’s most naturally gifted pianists wouldn’t be allowed to educate another generation directly, Brubeck found a way to inspire on his own. Returning from World War II with his fellow soldier Paul Desmond. they banded together later to form a musical quartet. Following advanced education at Mills College with Professor Darius Milhaud “who encouraged [Brubeck]… to study fugue and orchestration but not classical piano,” Brubeck managed to arrange his own entirely unique brand of jazz. With a musical penchant of employing “unusual time signatures,” Brubeck experimented with this throughout the rest of his career whether it was offering listeners unorthodox pieces performed in 5/4, 6/4, 7/4 or 9/8 time. Yet, surprisingly his own interest in mixing things up didn’t make him nearly the acquired taste that some of his other contemporaries were. By serving up his own individual brand of cool, sophisticated, almost classical sounding jazz, or “jazz for the rest of us,” he was far more mainstream than most of his colleagues and the proof wasn’t only in the sales of Time Out but also by finding his portrait on the cover of Time Magazine in 1954. In this remarkable rare collection from Acrobat Music Group, chronologically we catch up with Brubeck following the early success of their Jazz Goes To College Album. 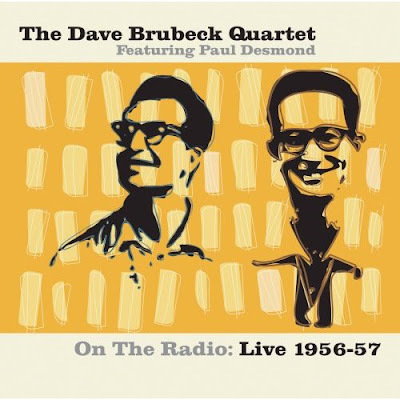 Featuring The Dave Brubeck Quartet and (as the liner notes reveal) his “long-time colleague and musical sparring partner Paul Desmond,” Acrobat includes twelve live recordings from 1956 gigs at New York City’s Basin Street Jazz Club and three from Chicago’s renowned The Blue Note in 1957. While the announcer cuts into the songs and sometimes it’s hard to guess which tracks comprise an entire twenty-five minute show, the quality of the music is first-rate. Kicking off with Brubeck’s own famous jazz standard “The Duke,” it strengthens considerably with the follow-up track “Stardust,” which gives the rest of his band including Desmond on alto sax, bassist Norman Bates, and drummer Joe Dodge a chance to shine. This is especially evident in Desmond’s wonderfully catchy start to “Gone With The Wind,” that brings Brubeck in significantly nearly two and a half minutes late and given the extraordinary musicality, one can almost sense the good natured musical rivalry between the two as they play. Although Bates would eventually be replaced by Eugene Wright and Dodge with Joe Morello, the phenomenal and sophisticated inclusions make the perfect background CD to unwind with after a hard day’s work. Featuring one of Brubeck’s signature pieces, “In Your Own Sweet Way,” I was even more surprised by some of the offbeat tracks, including what seemed to be an improvised last minute decision to play “The Trolley Song” (made famous by Judy Garland in Meet Me in St. Louis), complete with unexpected sound effects, to meet radio time requirements. It’s this laid-back and versatile vibe offered up by the group that makes them just so downright likable as Dave’s dubbed an all around nice guy by the announcer. Later on, it moves into some excellent other pieces that are instantly recognizable to devotees of standard jazz repertoire including yet another reprisal of “The Duke” which served as Brubeck’s introduction. While it’s an excellent disc overall, in one of my favorite numbers, “Love Walked In,” we experience a piece that’s truly epic in scope. Running extraordinarily long and earning applause after various members shine, moreover we’re quickly reminded just what makes great jazz so infectious to the ears. Namely, it’s the variations in color and mood that run throughout, almost inviting us to swing along for a moment, we’ve broken through a barrier of time and space and have joined Brubeck and the band. Of course, as soon as we’re ready to quit our day jobs and run away, again, they’re back, this time with “Here Lies Love” and the rest, making us realize that in the end, jazz is best left to the pros, whether they can read sheet music or not.